In Spain summer means music festivals. Some of them are: Sonar Festival in Barcelona in June. Monegros Desert Festival in Fraga, Huesca in July. Festival Internacional de Benicassim in Benicassim in July. Summercase in Madrid in July and Azkena Rock Festival in Vitoria - Gasteiz in September. Spain belongs to one of the few areas in the world where wild horses have survived since ice ages. There is evidence that horses have been living on the Iberian Peninsula since 5000 BC These medium-sized horses originally lived mainly in the plains of southern Spain, an area that we all know the name of Andalusia. Then nobody knows for sure what happened, but today there are still wild horses living in northern Spain, although it seems incredible. The herds graze freely in the northern Spanish provinces of Galicia. The festival Rapa Das Bestas is celebrated in Galicia at the end of June, July and August. The wild horses from the mountains of Galicia are gathered in a "Curro", a kind of arena, where they are marked and both the tail and the mane are trimmed. Then the horses are returned to their freedom in the mountains. In the province of A Coruña: A Capelada (Cedeira) June 29, As Cañizadas (Pobra do Caramiñal) 12 / 19 July. In the province of Lugo: Candaoso (Viveiro) 1st Sunday in July, Campo do Oso (Mondoñedo) Last Sunday in July, 0 Valadouro (Santo Tomé) First Sunday in August. In the province of Pontevedra: Moug (Oia) June 8, Morgadáns (Gondomar) June 15, San Cibrao (Gondomar) June 22, Sabucedo (A Estrada) July 6, Monte Castelo (Cotobade) August 3, Parry Arta (A Cañiza) August 31, 0 Galiñiro (Gondomar ). La Rioja is undoubtedly a wine region that most people know, but life in Haro (La Rioja) is not only serious sleepy wineyards and wine cellars. A wine war / wine battle is tradition in the region, and that means that wine is the only weapon. The wine battle festival i Haro takes place on June 29. It starts at 7 o'clock in the morning with a parade through the city. Most participants are dressed in white clothes and wearing a red scarf. All of them carries wine in different cups, jugs and bottles. They are on their way to the park Los Riscos de Bilibio where the festival ends with food and wine. Staying close to the Spanish coast or on any of the Spanish islands on July 16 you should try not to miss the fishermen's and sailors' Fiestas del Carmen where they celebrate their patron saint: Virgen del Carmen. Boats and ships are decorated with flowers and beautiful colours and then carry away with the patron saint in a maritime procession, often between different ports where a lot of people are waiting for the sailors and the fishermen. The Fiestas Virgen del Carmen are a must of the Spanish summer. The festival celebrates when the Vikings arrived from Scandinavia and conquered large parts of Europe. After the Vikings conquered large areas in southern France, they also tried to conquer parts of Spain: The Normans land on the north Spanish coast and it is the historical event that are related to the viking festival in Galicia. One of the Andalusian cities with the most traditional Spanish character is Jerez de la Frontera in Cadiz. Jerez is the home of sherry wine. To visit any of the sherry bodegas is almost a must when one is in place. It is best to book in advance if you wish to visit the wine cellars in Jerez, you can not just "drop in". But Jerez de la Frontera is much more than that. Many believe that flamenco culture was born in Jerez and the city has a huge tradition of horse breeding and dress ring. The Spanish Riding School in Jerez is probably the world's best and no one can see the show without being amazed. In recent years motor sports and golf have taken their place in the Jerez. 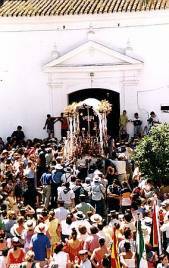 The festivals and events happens continously throughout the year in Jerez. There is always something going on in Jerez de la Frontera. In the month of May the horses and the festival "La Feria del Caballo" are the highlight in Jerez de la Frontera. The huge festive area of 52 000 m2 is illuminated with 1.2 million lamps and is visited by more than 2 million people. It is said that half a million bottles of sherry are sold (And drunk) during the festive week where horses and parades are all over the city. In September, the Autumn Festival in Jerez is going on during almost three weeks, "Fiestas de Otoño". The festival is a mix of all local traditions: Wine, horses and flamenco, what makes it a lovely Andalusian cultural festival. One of Spain's most unique festivals is the "Tomato War" or "Tomato Fight" that takes place in the municipality of Buñol in Valencia on the Mediterranean coast in eastern Spain every summer. According to the famous travel guide book Lonely Planet this Spanish Festival is one of very best festivals in the world. (That is if you don't mind getting pelted with ripe tomatoes or if you enjoy throwing ripe tomatoes to see others dressed in tomato sauce! Lonely Planet says: "World’s very best festivals: Getting pelted with ripe tomatoes may sound like a punishment reserved for medieval rogues in the stocks, but it’s all in the name of fun at La Tomatina. For morning a year, the small town of Buñol in eastern Spain dissolves into the world’s greatest tomato fight"
The event La Tomatina (Tomato-throwing Festival) in Buñol in is considered to be of national tourist interest, although it may seem very silly to throw ripe tomatoes at each other. The Spanish festival called "La Tomatina" is since 2002 one of the privileged events in Spain that are included in the list of festivals with national tourist interest. Minorca: The tiny Mediterranean island Minorca belonging to the Spanish Balearic Islands is not only sun and beaches but also the horses own paradise in Europe. The truth is that the number of horses per square kilometre of Minorca is the highest in Europe. 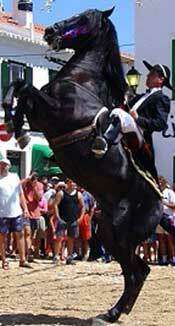 The Mediterranean island Minorca even has its own breed and of course also a festival where horses are the highligt. Seville "feria" or as it is known: Feria de Abril (April festival), is probably the biggest festival in Spain. La Feria de Abril, takes place in Seville two weeks after Easter, never mind if it has to be in May, they still call it April Fair. La Freia de Sevilla or Seville Fair is like the village festivals which are celebrated in all Spanish towns and cities once a year, but in a huge version. Seville's famous celebrations Feria de Sevilla started in 1849. Then it was only a regional cattle market, held for the first time. Today the yearly festival in Seville is one of the most important folkloric events in Europe. Andalusia is a region with many traditions and most have a strong religious connection. One of the most spectacular festivals that can be seen in Spain is the pilgrimage to El Rocio, which annually draws over one million catholics in a small village in Huelva, Andalusia. The village El Rocio has over the year only a few hundred inhabitants, which gives an idea of its small size. The religious festivals highlight is associated with Whitsuntide. The streets in the northern Spanish city of Pamplona in Navarre are filled each year with bulls and people from all over the world. The celebrations are taking place for nine days, with its nine nights and the famous running of the bulls in early hours every morning while the festival lasts. All Spanish towns celebrate their saint once a year, but Pamplona do not follow the usual festive protocol and has become world famous for the bulls and the bull running festival. The festival Las Fallas in Valencia in Spain is not like any other festival or celebration in the world. Valencia’s year-round festive air reaches its highest during the Fallas festival in spring. The festival consists of the burning of enormous, elaborate papier maché dolls. It is yet another of many Spanish fiestas that started rather modestly, carpenters would burn wood shavings to mark the end of winter and evolved over the centuries into an enormous party involving the entire population of Spain’s third largest city, Valencia. The streets of Valencia are filled with huge colourful statues during the festival, those are made of paper and board and called Ninots or Fallas. All of them except one will burn in fire on the last day of the festival. Only the winning paper statue will be saved from the flames of fire and brought to the museum that houses all the winning fallas and ninots. The paper statues that makes up the highlight of the yearly festival in Valencia can be up to 15-20 feet high. One of the most traditional festivals in Spain, where Moors and Christians will once again meet on the Costa Blanca in the Valencia region. The battles between Moors and Christians takes place in Alcoy, Alicante on 22-24th April. The festival is considered to be of international interest in culture. When spring comes Cordoba in Andalusia flowers up for the summer: The Festival "Los Patios de Córdoba" belongs to the spring. The classic Southern architecture of Cordoba is almost always full of "patios" which translates as courtyards, where local people protect themselves from the Spanish summer's hot temperatures. In the Spanish hinterland, the days in July-August almost unbearably hot, with temperatures well above 40 degrees Celsius during the hot Spanish summer afternoon hours. Tarragona is a city of light and colour. Its wonderful climate, Mediterranean character, friendly atmosphere and the hospitality of its people make it a great place for leisure, both festive and cultural, in the open air. Tarragona is synonymous with Fiesta (parties) and the fiesta is lived in the street. The city hosts regular musical and theatrical productions as well as a diversity of leisure and cultural events that have gained international acclaim. Tarragona’s festive calendar covers the entire year with its range of traditional festivals, both local and regional. Tarragona offers a wide variety of traditional festivals to its visitors, such as its carnivals. During the two weeks prior to Easter the International Dixieland Festival is celebrated, it is currently the only one of its type in Spain. Tradition and spirituality coexist at Easter in Tarragona, being the most time-honoured in Spanish Mediterranean, with its Santo Enterro procession taking place in the afternoon on Good Friday. It originated in 1550 and has been declared Traditional Festival of National Interest by the Generalitat de Catalunya. Roman History Popularization open days called Tarraco Viva, celebrated in the second two weeks of May, allow the visitor to contemplate reproductions of life during Roman times. Trials, military parades, and gladiator fights are relived and dishes eaten by our Roman ancestors can be sampled in restaurants of the city. During the summer months exciting performances by the Castellers (human castles) can be enjoyed. In Tarragona there are four colles (groups) that raise up daredevil castles of up to nine stories high. Also during the summer months the Festival d’Estiu (ETC) (summer festival) takes place, consisting of theatrical, musical, dance and cinematic events as well as a classical music show, a Kesse show of new trends in music and from all over the world, open air dance series, etc. During the entire first week of July the International Fireworks Competition is held. 19th August is Sant Magí, the city’s patron saint. Over four or five days the Castells (human castles), the Sant Magí procession, night parties, rock, jazz and habaneras (music from Havana, Cuba) serve as preparation for the grand festival of Santa Tecla.·The Festa Mayor (patron saint festival) is commemorated on 23rd September in honour of the city’s female patron saint, Santa Tecla, originally from 1370. This festival was declared Traditional Festival of National Interest by the Generalitat de Catalunya and Festival of National State and Tourist Interest by the Spanish Government. Over ten days Santa Tecla fills the city with an explosion of happiness, music, colour and tradition. All the traditional elements participate in the Popular Procession, including the richest combination of dances and spoken dances as conserved within Catalonia. And now you can enjoy the House of the Festival, which opened recently. The first Sunday of October of every even year is the day chosen for the main 18 colles castellers (human castle groups) of Catalonia to congregate in the bull ring for a long, controversial and exciting Castells Competition. In the month of November a Setmana Literaria (Literary Week) is organised and the Literary Prizes of the City of Tarragona are awarded in different sections: poetry, narrative, theatre and translation. During the Christmas period the city becomes colourful with the lights put up all around the streets and squares and a Christmas Fair is held in the Rambla Nova, as well as an important exhibition of nativity scenes. San Sebastian becomes intensely vibrant during the festivals held throughout the year. The annual fiestas include (in chronological order, starting in January) the unique “Tamborrada” drumming parades held on the feast day of the city's patron saint, St. Sebastian; Carnival; Semana Grande – ‘Big Week’ and its famous International Firework Competition; Euskal Jaiak - the Basque Festivities; and St. Thomas' Feast Day. San Sebastian has worked very hard to foster art and creativity on all levels; proofs of this are the many Festivals held throughout the year in the city. If you time your visit to coincide with one of the many festivals in San Sebastian, it will show you its most cosmopolitan face. In addition to the prestigious San Sebastian International Film Festival, which every September brings together on its pink carpet the full national and international filmmaking panorama, in San Sebastian many other top-flight festivals are held. The city streets move in time to the music during the International Jazz Festival in San Sebastian, held at legendary venues such as Trinidad Square and the terraces of the Kursaal, as well as on the beach, and also during Music Fortnight – one of Spain's most traditional and best-known classical music festivals. The same streets are turned into improvised stages when the dFeria Theatre Fair begins. Coinciding with Halloween, the Horror and Fantasy Film Week in San Sebastian turns the city into a horror film. San Sebastian demonstrates its commitment to defending civil rights and freedoms during the Film and Human Rights Festival, while creativity gets the professional treatment at El Sol Latin American Advertising Festival. One of the latest festivals to choose San Sebastian as its venue is the Surfilm Surfing Film Festival – young, dynamic and full of activities that link the art of filmmaking with the world of surfing on our doorstep. Spanish festivals and fiestas in Galicia in North Spain: The typical Spanish festivals and fiestas in Galicia are many through the year. Religious celebrations, food fairs, easter celebrations, viking battles, wild horses festival ... Galicia is fiesta! The Xunta de Galicia has also declared the following Galician festivals to be of interest to tourists: The Cheese Festival of Arzúa, ARZÚA (A Coruña). An event that pays tribute to the typical cheeses of the region. Cheese tasting. First Sunday in March. Carnivals are tradition in Spain, but not in all areas. It is mainly on the Canary Islands, Gran Canaria and Tenerife, and in Cadiz where the Spanish carnivals are celebrated. In the Canary Islands and especially in Gran Canaria and Tenerife the carnivals are the year's great highlight and they are very similar to the carnival in Rio de Janeiro.